Using insights from 47 million images, music tracks and collection of videos, Shutterstock's annual infographic looks at which searches and styles are on the rise, and predicting what will rule the creative world in 2014. According to Shutterstock these three trends are truly universal - impacting design, photography, and video across every continent. "The global aesthetic keeps trending toward simplicity, with outlined icons and other linear styles on the rise. Searches for “line icon” increased 921 percent in 2014. 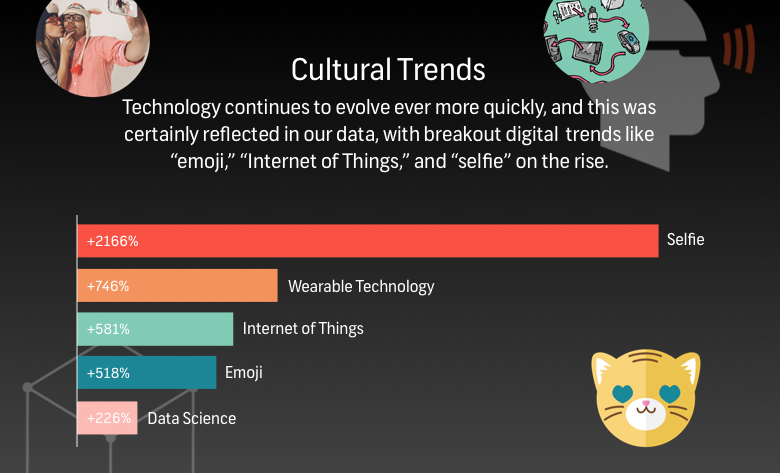 Technology continues to evolve ever more quickly, and this was certainly reflected in our data, with breakout digital trends like “emoji,” “Internet of Things,” and “selfie” on the rise." Take a look at the infographic below for more trends and prediction.